HIGHWIRE FARM IS CLOSED TODAY, SATURDAY APRIL 13,2019 DUE TO RAIN/MUD…WE WILL BE OPEN TOMORROW 4/14/19 10 – 4. HOPE TO SEE YOU THEN. EASTER SUNDAY, 4/21/19 1 PM EASTER EGG HUNT, FIRST COME FIRST SERVED..RAINDATE SUNDAY 4/29/19 ANY QUES. CALL 203-263-4522. HIGHWIRE DEER & ANIMAL FARM WILL BE OPEN MONDAY, OCTOBER 8, 2018 (COLUMBUS DAY) weather permitting 10 – 4. OCTOBER BEGINS OUR “WEEKENDS ONLY” (weather permitting) 10 – 4. HOPE TO SEE YOU SOON. THANK YOU. Highwire Farm WILL NOT OPEN THIS WEEKEND 4/14 & 4/15. This springs weather has not worked in our favor for pen cleaning and moving animals outside that require warmer weather. We will try agian 4/21 & 4/22. Thank you for your understanding and the animals thank you too! 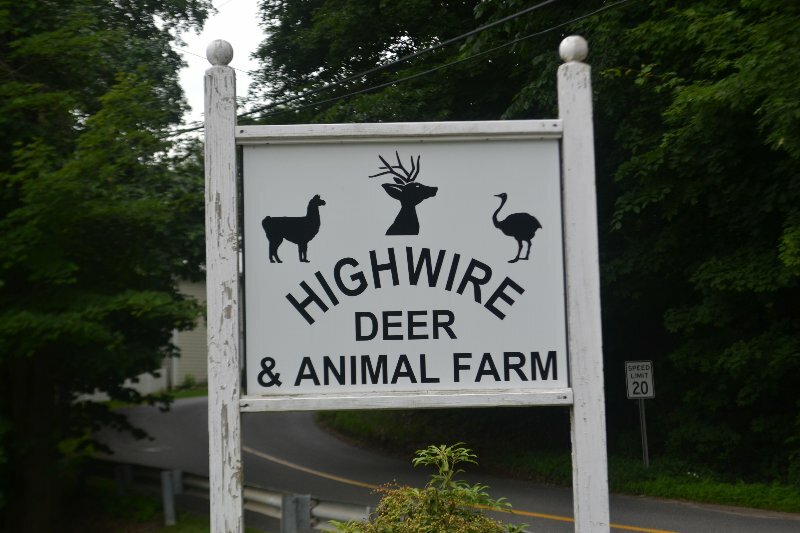 HIGHWIRE FARM WILL OPEN WEEKENDS IN OCTOBER 2017 WEATHER PERMITTING…IF WEATHER IS QUESTIONABLE PLEASE CALL THE FARM AT 203-263-4522 BEFORE YOU COME. THANK YOU. Beginning today Wed 9/20/17, HOURS TUES – FRI 11 – 2 …WEEKENDS IN SEPTEMBER STILL 11 – 4 “WEATHER PERMITTING”. Thank you. FRIDAY, AUGUST 18TH 2017…CLOSED DUE TO RAIN…HOPE TO SEE YOU ANOTHER DAY. THANK YOU. BABY GOATS BORN SUNDAY, JUNE 4TH, 2017!! SPRING HAS ARRIVED 2017 !!! HIGHWIRE FARM WILL BEGIN ITS 2017 SCHEDULE ON 4/15 & 4/16 2017. WE ARE OPEN 11-4 WEEKENDS IN APRIL…THEN…MAY, JUNE, JULY, AUG & SEPT TUESDAY – SUNDAY 11-4 WEATHER PERMITTING. We look forward to seeing you. Call if you are interested in having a Birthday Party or bringing a Group to the farm. 203-263-4522, leave a message. HIGHWIRE FARM IS LOOKING FORWARD TO SPRING. WEATHER PERMITTING, WE HOPE TO OPEN MID-APRIL…WE ARE EXTENDING OUR DAYS OPEN TO TUES-SUN 11-4 (WEATHER PERMITTING). WATCH FOR DETAILS. ALSO, IF YOU WANT TO BOOK A BIRTHDAY PARTY OR IF YOU KNOW OF A GROUP WHO WANTS TO VISIT (DAYCARE, ETC) BE SURE TO CALL 203-263-4522, LEAVE MESSAGE AND WE WILL RETURN YOU CALL. HOPE TO SEE YOU SOON! THANK YOU ALL FOR A GREAT SEASON…LOOK FORWARD TO SEEING YOU ALL IN THE SPRING…CHECK IN MID-APRIL 2017 FOR INFO. HIGHWIRE FARM DOES NOT ACCEPT CREDIT CARDS. ADMISSION: CHILDREN UNDER AGE 2 ARE FREE, ALL OTHERS PAY $8.00 EACH. GROUPS MUST CALL AHEAD FOR RATES AND RESERVATIONS. Highwire Farm will be open, WEATHER PERMITTING, Wed – Sun 11-4 thru September……October is always “iffy” so check back. Thank you. LEMURS HAVE ARRIVED…Due to heat and humidity (and when we get rain) we may not open or we may close early..please call ahead if you have any questions. 203-263-4522. BABY GOATS ARRIVED WEDNESDAY, JULY 20TH. July 6, 2016 thru July 9, 2016, The farm will be open from 11 – 2 due to the extreme heat and humidity…as usual if it rains we won’t be open at all. Sorry for the inconvenience. The farm will now be open WEDNESDAY thru SUNDAY thru August WEATHER PERMITTING, 11-4 (beginning 5/11/16). Highwire Deer & Animal Farm is home to a large family of exotic and wonderful animals located in Woodbury, Connecticut. Come visit the farm and have the opportunity to visit with, touch, pet, and feed a wide range of animals who love visitors. Click the links above to learn more about the farm and the animals, and how to get here.